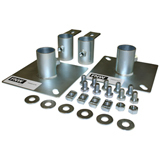 The figure ELKITC elevation kits are designed specifically to meet a wide range of installation applications for large pipe, HVAC, ducting, and conduit. Built-in versatility allows for installations on sloped, uneven, and stepped roof elevations. They are compatible with the FNW figure 7715 and 7730 pipe supports and FNW strut accessories and pipe hangers. The kits can also be installed on concrete floors for equipment elevation projects.